Thanks to everyone who sends me quizzes they think the readership would enjoy. I've got them all & will post selected ones from time to time throughout the year. Please keep them coming. Please solve the Compound Interest Quiz below. I remember a life insurance salesman who regularly called on my father when I was a young boy talking about "the magic of compound interest" – which is illustrated in the quiz below. If something is growing 100% per annum, how much does it grow every six months? "It's obviously an acknowledgement that it's not particularly easy to take away healthcare for millions, to go ahead & take away the most vulnerable people's health insurance, & then give tax breaks to the wealthiest" was the way, on July 11, that NJ Senator Bob Menendez summed up the GOP's predicament in trying to repeal, repeal & replace, or repair ObamaCare – a useless time-wasting exercise that has been going on since January. Menendez's above statement certainly showed that in trying to disassemble ObamaCare there was enough for all the factions in the GOP to dislike, which they did but for different & in many cases really quite opposite reasons. BO was always counting on Republicans making a first class royal mess out of trying to dismantle ObamaCare so that the way would be paved for universal single payer healthcare to become the law of the land but also that Republicans would get the blame for the trouble that BO created in the first place. After failing to get enough support in March to replace ObamaCare the House finally (barely) passed a bill in May, 217 to 213, on Trump's 105th day in office with 20 Republicans voting "NO", including three from NJ - Leonard Lance, Chris Smith, & Frank LoBiondo. From there the Senate decided to write their own ObamaCare replacement legislation knowing full well their bill would have to be reconciled with the House's – a step never gotten to as it stands now. Senate Majority Leader Mitch McConnell followed a tortuous path trying to weave his bare 52 to 48 Republican majority to a consensus bill – i.e., McConnell could lose only 2 Republican votes to secure passage with VP Pence breaking the tie. Just like in the House, Senate Republican centrists (& 16 Republican governors) wanted more Medicaid spending while libertarian Republican Rand Paul wanted a clean full repeal of ObamaCare so there was a wide gap to pull together. 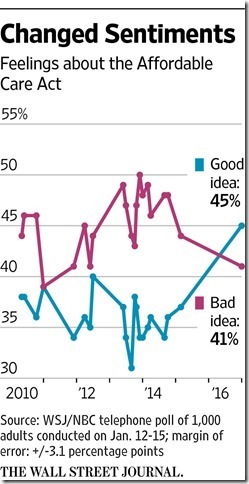 McConnell's work was complicated & delayed by John McCain's hospitalization (which turned out to be for brain cancer) meaning that with two assured Republican defections the Democrats would win any vote 50 "NO" to 49 "YES". Finally, with more than two Republican defectors for every version of the ObamaCare replacement bill being considered, the entire matter was dropped for lack of support to repeal ObamaCare after seven years of bluster about how Republicans were going to do just that. It is a long shot that the bill will be resuscitated to try again. Although it shouldn't, this is going to cause a political problem for Republicans with their base – check out the graphic below & note that the top line does not say "repeal & replace" or "repair". Along the way it was suggested by President Trump to bring back HR 3762 – the bill that was a repeal-only bill that was passed by both chambers of Congress & presented to BO on January 6, 2016 - which of course BO vetoed. A short history regarding HR 3762 is constructive relative to the current healthcare happenings. For the last seven years of BO's presidency the Republican Congress voted to repeal ObamaCare in one form or another sixty two times by one count. Finally, starting in October 2015 then-Congressman Tom Price (now Secretary of Health & Human Services) sponsored HR 3762 that was a very limited repeal bill that left much of ObamaCare in place. Next, the Senate amended HR 3762 to repeal ObamaCare as far as possible using the Senate budget reconciliation process. The Senate amendment repealed ObamaCare's individual & employer mandates by eliminating the penalties for noncompliance, funding for Medicaid expansion, exchange subsidies, fourteen of the taxes included in the original law, & funding for Planned Parenthood for one year. In short, the Senate Amendment crippled ObamaCare & was exactly what the Republicans had promised to do for four consecutive election cycles (2010, 12, 14, & 16). The original HR 3762 was revised to include the Senate Amendment. HR 3762 passed the House with all but three Republicans voting "Yes" – Robert Dold - IL, Richard Hanna – NY, & John Katko – NY & all but two Republicans in the Senate – Susan Collins – ME, & Mark Kirk – IL. Dold, Hanna, & Kirk all lost their reelection bids on November 8, 2016. So with such a clear cut path to keeping their seven year promise to repeal ObamaCare why wasn't this bill dusted off & presented to Trump on Inauguration Day? – which of course he would have signed. 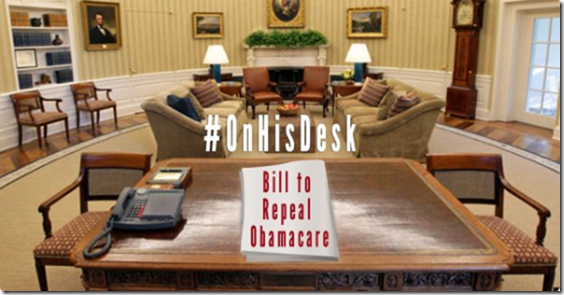 "First priority in 2016: Putting bill on Obama's desk that repeals ObamaCare," Ryan tweeted along with the following photo. This first priority of 2016 should have been the first priority of 2017 – but we all know why it wasn't. What the history of HR 3762 clearly shows is that we do not know what centrist Republicans really believe about the issues that are important to our country – we do know what they say but cannot draw from that what they believe. For instance, NJ Congressman Leonard Lance said "We want to repair the ACA. I have never favored repeal without replacement" yet there is his name right in the middle of votes for repeal-only in 2016. And WV Senator Shelly Moore Capito said "I did not come to Washington to hurt people" implying that a repeal bill would hurt people – Capito voted for the 2016 version of the repeal-only bill. Voters should not take the wrong message out of this miserably inadequate display described above by blaming anyone other than the centrist Republicans who derailed the ObamaCare repeal effort – so many of these career politicians have been documented on this blog over the years as opportunists who have perfected the technique of doing little more than collecting their congressional salaries while never showing any endearing consistent principles that would make you surprised @ their vacillating votes on healthcare reform – these people don't care about their constituents, the country, or the oath they take to support & defend the Constitution. 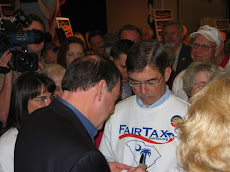 They represent the wishes of their constituents as far as following these wishes gets them reelected – whether or not such actions hurt their constituents. 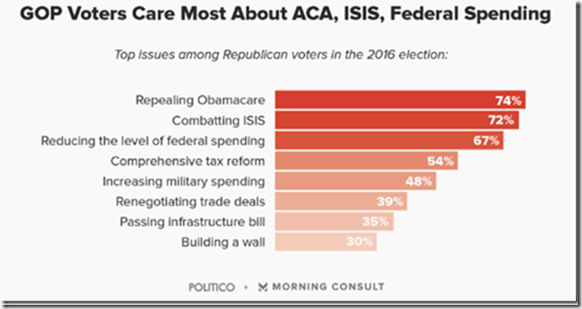 There are not enough people in America who believe it free market capitalism that a clean repeal of ObamaCare is going to happen – as represented by the number of Democrats in Congress coupled with the number of centrist Republicans. Leonard Lance has been my congressman for years & I am not @ all surprised @ his position on ObamaCare repeal, which is an example of why I have never voted for him. This healthcare reform episode described herein proves that we have to work doubly hard to find suitable candidates or the career establishment politicians will continue to frustrate. Don't talk about the Republican brand or President Trump being hurt by Congress's failure to produce a repeal-only ObamaCare bill – talk about the need to replace the centrist Republicans who are really too far left. Democrats would love to see the entire Republican Party morale go down knowing that the defeat of healthcare reform was caused by a group of people who were never committed to any cause other than extending their own political careers. Trump cannot fire Members of Congress or have them lose a contract. The centrist Republicans get paid the same as the good ones & in this sense it is clear that they all work for us because the voters have the final say – & the centrists have got to go. 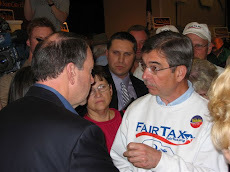 Centrist Republicans join with Democrats to form one Big Government Party – we need to replace them with Tea Party–type candidates who are thoroughly vetted to make sure they are the real deal. The Senate Conservatives Fund has already announced they will find & fund primary challengers for centrist Republicans. I'm sure that the Club For Growth, Freedom Works, & Heritage Action will do likewise so voters should have plenty of choices. Donors should not lose heart @ this recent turn of events but should look forward to helping new candidates especially in the Senate where in 2018 only eight Republican seats are being defended while 25 Democrat seats (including two seats held by Independents who caucus with Democrats) are being defended. Republican voters are frustrated but should not take these frustrations out on the entire party because there is a very good theoretical statistical chance that stronger & larger majorities can be obtained in both the House & particularly the Senate in the 2018 midterms. 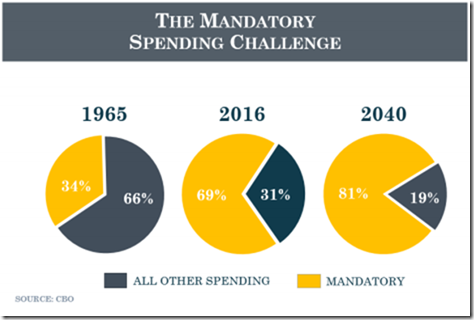 HR 3762 provides the clearest example I have ever seen to identify the phonies – the big question is do we have the numbers to make the needed changes? I'd have to see it to believe it. Click here to see the House repeal-only vote in 2016 & here to see the Senate repeal-only amendment vote that was attached to HR 3762 – BTW, Bernie Sanders was the only senator to not vote when the amendment came to the Senate floor. I intend to use the ObamaCare repeal-only bill, no matter what happens with the ObamaCare replacement bill from here on out, if anything, as a litmus test. On Friday I called the congressional switchboard in Washington – you can reach any senator after pushing 1 & any congressman after pushing 2 – @ 202-224-3121. Ask how they intended to vote if a 2017 repeal-only bill was presented & see what you learn. I hope such legislation is presented in both chambers so everyone goes on record – but if it doesn't the phone call is the next best thing if you are interested - then you will know what they say but will still have to guess what they believe. Readers of this blog who are students of the Constitution know that healthcare is not a right but rather is a good like food, clothing, & shelter – this is true whether or not the Supreme Court saw no violation to our Constitution with the ObamaCare legislation requiring people to buy a product they did not want & then penalizing them using the IRS if they didn't. In any event ObamaCare is the law of the land, having passed the scrutiny of all three branches of the federal government, & healthcare entitlements are on a path to overwhelm the country's finances with an unfunded liability of scores of trillions of dollars that are ignored by the federal government. 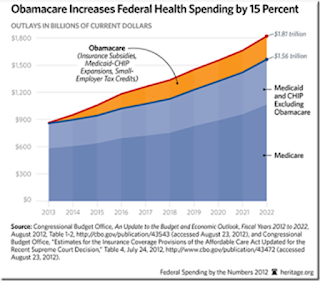 We should be working to reverse this mindset of government dependence & its accompanying financial liability & irresponsibility that ObamaCare just adds to as shown on the graphic below. See referenced post for proposed solutions. Also see graphic below from the just released House budget that shows the trend of all mandatory entitlement spending, of which ObamaCare, Medicare, & Medicaid are a part. But just repealing ObamaCare still may not get us home safely. Judge Napolitano has cautioned of another problem – the Supreme Court ruled in 1970 (Goldberg v. Kelly) that procedural due process is required before a recipient of certain government welfare benefits can be deprived of such benefits – ObamaCare certainly is a government welfare benefit & "medical care" is specifically listed in the holdings of the Court's determination in the referenced case so we shouldn't be surprised if the courts get involved if ObamaCare is repealed. In the same vein to people losing government welfare benefits we also have to remember that ObamaCare not only affects the 22.5 million people who have acquired healthcare insurance through both the government paid Medicaid expansion & the 75% subsidy funded individual insurance market but also another 71 million people who have had their employer provided healthcare insurance upgraded to conform to ObamaCare mandates - & many, if not all, of these people have come to like these upgrades to their employers' plans. These 71 million people do not want anyone even thinking about changing their improved healthcare insurance plans – this could very well be what is reflected on the graph below that for the first time in January 2017 showed more people thinking ObamaCare is a good idea than a bad one. What's not to like except it cannot be financially sustained. Realizing that over 90 million people are being directly affected is a powerful political lure to make just about any modern day politician want to only tinker around the edges of ObamaCare leaving much of it in place. It is up to the lovers of liberty, if we still have enough of them left in America, to find the future senators/congressmen who can look beyond the next election & see what really lies ahead. The 4th of July holiday is still vivid enough in memory that we can appreciate Mark Dice's interviews with people celebrating the holiday who demonstrate what Thomas Paine was talking about above. I sensed the interviewees in the above video were amicable, good-natured, easygoing, & non-confrontational (or else Mark Dice would have been punched in the nose more than once). But the interviewees were also poorly educated & were far removed from having any sense of civic responsibility or being responsible contributing members of society who knew the least little bit about the country they live in – except for the final two who were on a par with fifth graders of my day. It is the treacherous combination of friendly people who "yield up the privilege of thinking" that produces the dangerous exploitative environment that attracts collectivists, statists, socialists, communists, Marxists, & Islamic fascists who are here with the purpose of taking both the wealth that has been created in this country & the freedom given to us naturally by God until "the last shadow of liberty quits the horizon" in America. 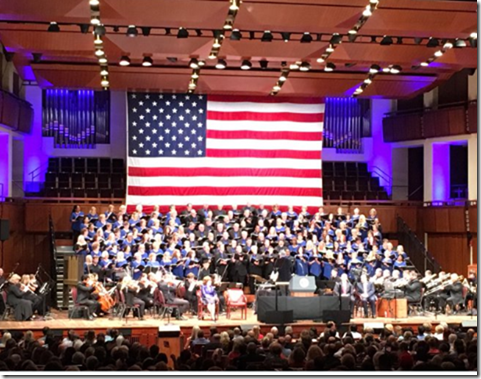 On Saturday night of Independence Day weekend, as part of the Celebrate Freedom Rally @ the Kennedy Center for the Performing Arts, the choir of the First Baptist Church of Dallas (pictured above) premiered a song entitled "Make America Great Again" – written by the church's former minister of music. Click here to hear the real version of the performance that President Trump tweeted @ 6:38 AM on July 4. The following partial slave trade history, pre 7/4/1776, illustrates this point – source New Internationalist. The ancient Greeks enslaved woman & children & simply slaughtered the more unruly men. In 5th century BC there were more slaves than free citizens in Athens – the birthplace of democracy. Slave trading was big business in the Roman Empire. Roman emperors owned thousands of slaves who were worked to death mining gold & silver for the Empire. In the early Middle Ages the Church condoned slavery – Christians, Muslims, & Jews all partook of slave trading. In the 16th century Pope Paul III threatened those considering leaving the Catholic Church with enslavement. The Portuguese & Spanish were the earliest transatlantic slave traders. Virtually all the European colonists converged on West Africa trading liquor, tobacco, arms, & trinkets for live slave cargo. The British were the prime slave dealers – bringing goods from England to exchange for African slaves whom they then sold to Portuguese & Spanish colonies in the New World. This slave trade built Britain's fortune. But all of this entrenched slavery had a chance to end – a beginning, a start to being able to change with the signing of the Declaration Of Independence & the founding & of the United States Of America on July 4, 1776. Free Negroes in five of the then thirteen states, to wit, New Hampshire, Massachusetts, New York, New Jersey, & North Carolina participated in the American Republic's democratic process from the beginning in that they were voters & in proportion to their numbers had the same part in making the Constitution that the white people had. Source – Mark Levin, Men In Black, page 15. During the Jefferson administration Congress prohibited the importation of slaves effective 1808 – but there was smuggling thereafter. The process of obtaining freedom for all men continued with the Missouri Compromise of 1819 in which Missouri was admitted to the Union as a slave state but slavery was prohibited in all the western territories. And of course the fighting of the Civil War resulted in the ratification of the thirteenth Amendment which banned slavery in the entire country. Although Lincoln certainly wanted to preserve the Union, the Civil War was fought for more than just the secession of eleven slave-holding states from the Union. Lincoln believed that free men should not be free to choose slavery for others. Lincoln knew that the United States Republic was the only noteworthy democracy in the world in the early 1860s & he believed that a significant portion of the young country could not abandon its founding principles & survive for long. All of our Founding Fathers & Lincoln were libertarians who focused on the definition of libertarianism & especially the second half of the definition in establishing a society based on limited government, personal responsibility, & free enterprise: individuals have the right to control their own bodies, in action and speech, as long as they do not infringe on the same rights for others. Lincoln used the second half of the libertarianism definition to reason that the only liberty the secessionists considered was their own with no regard for the violations to liberty they were inflicting on others. Although the thirteenth Amendment banned slavery in the United States "racism is an evil, irrational & morally contemptible doctrine - but doctrines cannot be forbidden or prescribed by law. Private racism is not a legal, but a moral issue - & can be fought only by private means, such as economic boycott or social ostracism." - Ayn Rand. Judge for yourself how America is doing in this moral regard. But to clearly see the sea change that took place on July 4, 1776 judge from the perspective that if there was no July 4, 1776, no Declaration Of Independence, no United States of America but rather thirteen British colonies whose residents were predominantly British subjects instead of future American citizens – there would still be unchecked slavery existing everywhere in the world as it had been since the beginning of civilization. To me America is one of God's two great gifts to the world.